Redefining what it means to be a modern SUV, the sporty and luxurious new Honda CR-V has been developed to provide the utmost in comfort. Plus, with an innovative hybrid edition that delivers exceptional performance, this is truly the most advanced and sophisticated SUV from Honda yet. Muscular wheel arches house 18-inch alloy wheels, while the elegant and athletic silhouette ensures that the CR-V makes its presence felt on the road. Fluid lines add to the aerodynamic nature of the vehicle, with the carefully sculpted front and rear bumpers reducing air turbulence for a smoother ride. The inside is equally as impressive, with premium upholstery and generous passenger space ensuring the utmost comfort. The cabin also comes packed with intelligent technology to enhance the drive. 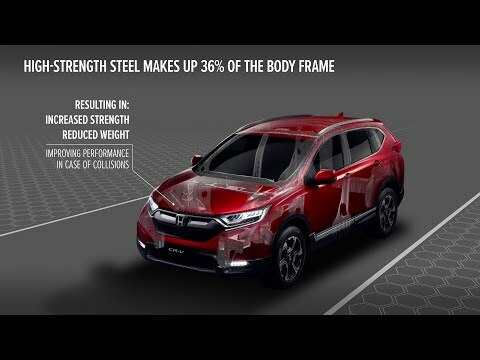 Honda Sensing - an innovative suite of driver assistance technologies - uses radar and camera systems to assist you in parking and manoeuvring in tight situations. Plus, with infotainment measures provided by the seven-inch colour touchscreen - which connects to your smart device - you can ensure you and all your passengers will stay entertained throughout your travels. Efficient, comfortable, and supremely well equipped, the exciting new Honda CR-V does it all and does it with style. Find out more by booking a test drive at Grierson and Graham in Dumfries today.